This was very easy to make and you can replace any of the ingredients to create a different meal. Instead of using fish, we could have used tofu, beef, shrimp or chicken. You can also adjust the spiciness by adding as much, or little curry paste you want. In order to reduce the number of calories in this dish, we used light coconut milk. We did not want to cut it out completely because coconut milk really adds a special flavour to any curry. 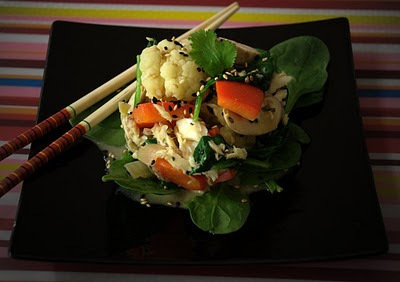 We served it on a bed of spinach rather than rice, fewer carbs and healthier. We started by cooking onions, garlic fish sauce, green curry paste and ginger. Once the onions were cooked, we added a can of coconut milk and brought it to a boil. We reduced the heat and added the cauliflower and 2 tilapia filets. Once those were cooked we added mushrooms, finely chopped mint leaves, red peppers and spinach. This dish can be made in so many different versions. We will definitely try this again.